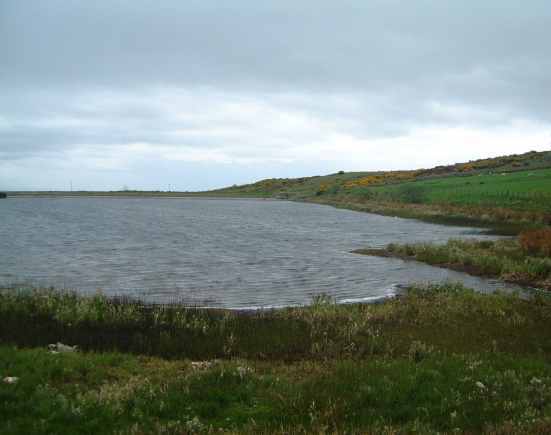 This is a small hill reservoir at 170 metres on the boundary of farm land with hedgerows and moor with young plantation. It is situated km west of Dalry off the minor road to Fairlie, signposted The Moor Road . It is owned by Dalry Garnock Angling Club and visitors should be considerate to the anglers and the adjacent farm. There is a picnic site with panoramic vistas of the Garnock valley. There is limited parking at the end of the farm track through the gate (please be aware of any livestock and don’t block farm access). There is a regular bus service along the A737, and Dalry has a main-line rail station. The area is accessible by bike from Dalry. Teal, Tufted Duck, Pochard, Mallard, Dabchick, Grey Wagtail . Breeding Common Sandpiper and Snipe . Reed Bunting, Chaffinch, Greenfinch, Linnet, Meadow Pipit, Skylark, Sparrowhawk and Hen Harrier . Dotterel and White Wagtail have been seen on passage. Continue over The Moor Road for Red and Black Grouse, Short-eared Owl , other moorland species.